Third person shooter-brawler WH40K: Space Marine is the continuation of Relic Entertainment’s long and passionate relationship with THQ’s recently renewed Warhammer licence, which has brought us the widely renowned Dawn Of War RTS franchise with its many expansions. Fans of the 40K universe praise Relic for sharing Games Workshop’s original vision and creating an experience that does justice to the source material by emphasising the themes and characterisations of its warring factions, while remaining incredibly fun to play. 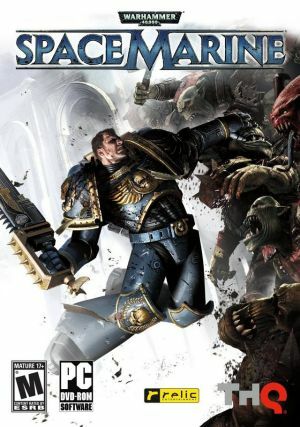 However, when it was released in September 2011, Space Marine was subject to some critical disapproval. Now, under the divine spotlight of the Steam Summer Sale, it has a chance at redemption. The main focus of the game is its campaign, in which the player takes control of a Space Marine captain, Titus of the Ultramarines, deployed onto an imperial forge world besieged by bloodthirsty Orks. This is where things may start to seem a bit foreign or nonsensical for anyone who hasn’t encountered Warhammer 40K before, but mercifully the story is not integral to the gameplay. Relic have gone to some lengths to create an atmosphere that fans will identify with, by creating a setting where war is quite visibly hopeless, unending, and on a scale of millions. The architecture and visual detail complements this to make the game a faithful extension to the 40K universe. The combat is a real high point of this mode, as Space Marine provides several diverse methods of engaging the vast hordes of enemies that populate the world. As well as a satisfying array of tactical weaponry from the tabletop canon, there is a very robust melee system which provides an excellent strategic balance between ranged and close quarters combat. There are combos which provide various ways to stun opponents, leaving them vulnerable to one of Titus’ vicious execution moves. These are reminiscent of the delightful ‘sync kills’ from the Dawn of War franchise, and evoke a similar sense of cinema. On the sidelines, there are wave survival and team-based multiplayer modes, both of which are orchestrated via a lobby and matchmaking service. They both offer a small collection of loadout customisation options for your character, which serve well to vary the gameplay and provide an opportunity to fulfil different roles on your team. In survival, or ‘Exterminatus’ mode, a team of four marines fights off increasingly numerous waves of Orks, with occasional timed challenges thrown in to boost the difficulty. While these do greatly encourage teamwork and coordination, they sometimes verge on either the completely arbitrary or the woefully unimaginative. The melee combat is also noticeably toned down compared to that of the campaign, being relegated from gruesome carnage to ineffectual swiping, with the stun and execution mechanics being entirely absent. Unfortunately, the strength of Exterminatus comes more from the urge to complete it by clearing the 20th wave, rather than from innately compelling gameplay. I’m not really in a position to comment on the team multiplayer, because I was only able to play it for 15 minutes before Steam crashed, but what I do know is that it walks the treacherous road of XP-based unlocks. On my first venture into this mode, it was very obvious that the players with jetpacks and thunder hammers were going to be a lot more effective in battle than I was, but thankfully Relic have seen fit to provide a ‘copy loadout’ option for those brave marines who fall in battle against a much better equipped enemy. Just like EA/Westwood’s excellent Command & Conquer: Renegade before it, it seems that the transition from RTS to FPS has had a polarising effect on the popular opinion towards Space Marine. On top of that, people who don’t like or don’t know the 40K universe might discard it as just another slightly above average shooter. But if you are a fan of great atmosphere and fun combat with a cookie cutter storyline (spoiler: it was Chaos all along), you can’t go too wrong with Space Marine for 5 quid on Steam. Máu tươi hỗn loạn nghiền nát nội tạng từ trong miệng La Dương trực tiếp phun ra, đồng thời thân thể La Dương trắng bệch từ giữa không trung rơi xuống mặt đất. - Lục Ma, ngươi cũng muốn tìm chết sao. Giữa không trung, thân ảnh Nhạc Thành quỷ dị biến mất ngay tại chỗ. Thân ảnh Nhạc Thành biến mất, đồng thời ba đạo kim sắc lưu quang từ trong tay bắn ra, ba đạo kim sắc lưu quang trực tiếp xuyên thấu không gian nháy mắt đi tới trước người Lục Ma. Lục Ma vốn mượn thời điểm Nhạc Thành công kích La Dương mà đánh lén, tuy biết La Dương không chịu nổi một kích, nhưng nàng xuất thủ cũng không giấu được tầm mắt của Nhạc Thành, ngược lại bị ba đạo kiếm quang quỷ dị bao vây.